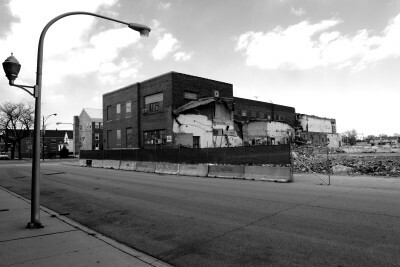 A cultural treasure resides at 45th and Vincennes in Bronzeville: Ebenezer Missionary Baptist Church. 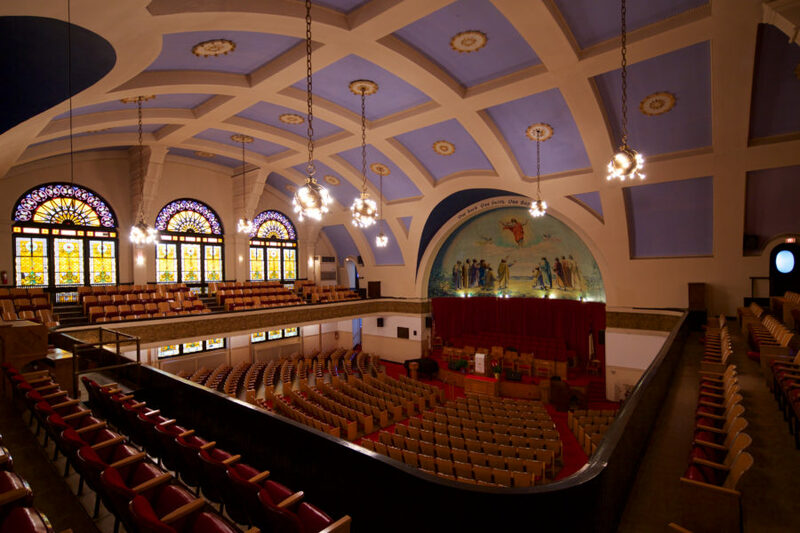 This church (and former synagogue) represents a grand alpha and omega: the birthplace of gospel music and the final work of legendary architect Dankmar Adler. Dedication announcement featuring drawing by Dankmar Adler. From Chicago Daily Tribune, March 11, 1899. 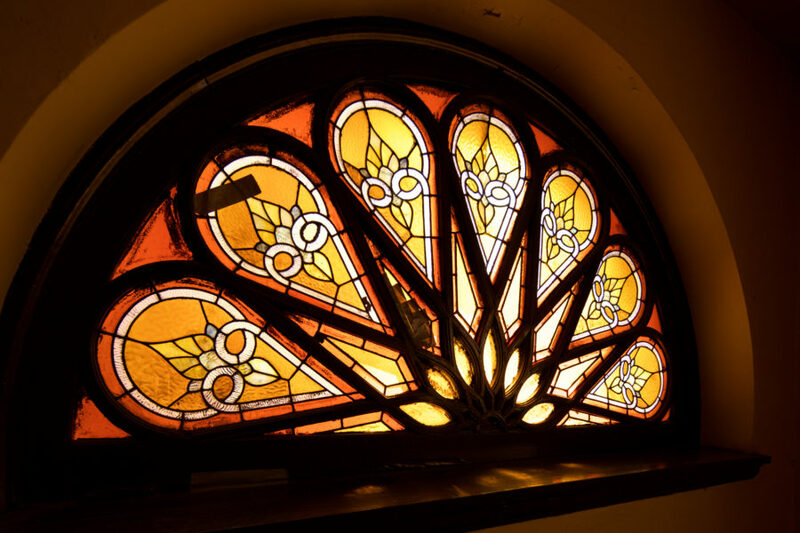 Before it was the Ebenezer Missionary Baptist Church, the building was a place of worship for what was originally known as Isaiah Congregation, formed in 1895. 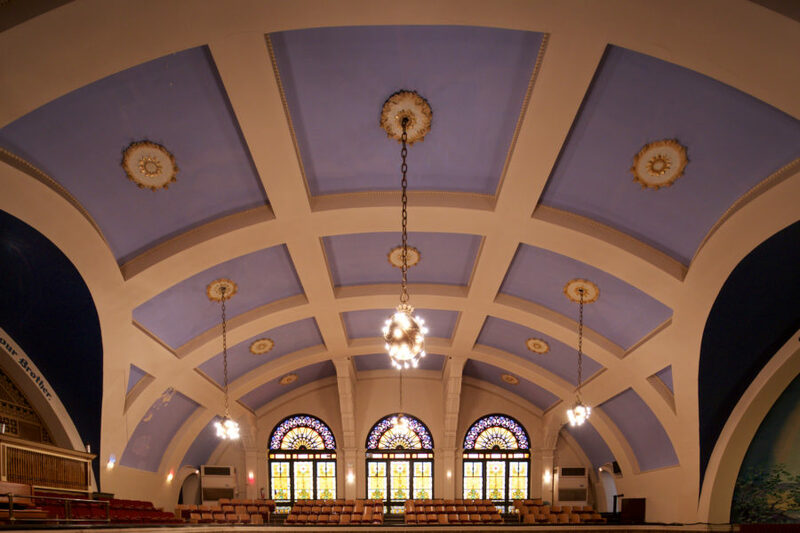 A few years afterward, the congregation purchased land at 45th and Vincennes for a new synagogue, later known as Isaiah Temple. 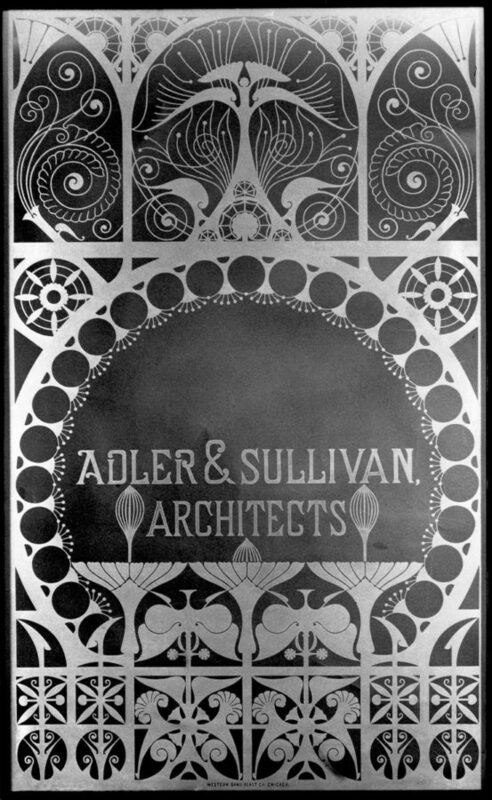 Dankmar Adler, the building’s designer, is best known for his partnership with Louis Sullivan at the firm of Adler & Sullivan. Dankmar Adler, World’s Columbian Exposition, c. 1891. Ryerson and Burnham Libraries Book Collection, Ryerson and Burnham Archives, The Art Institute of Chicago. Adler was born in Eisenach, Germany, in 1844. His name is a compound word for dank (thanks) and mar (bitter), given by his father reflecting the bittersweet story of Dankmar’s birth. His mother died while giving birth. After failing to get accepted into college, he received private instruction in drawing. With the help of his father, he later became an apprentice for John Schaeffer, a well-known architect. The apprenticeship was cut short by the Civil War, when he enlisted in Company M, First Regiment, of the Illinois Light Artillery. Adler served between 1862 and 1864. He managed to spend much of his time reading science and engineering books–furthering his education during wartime. 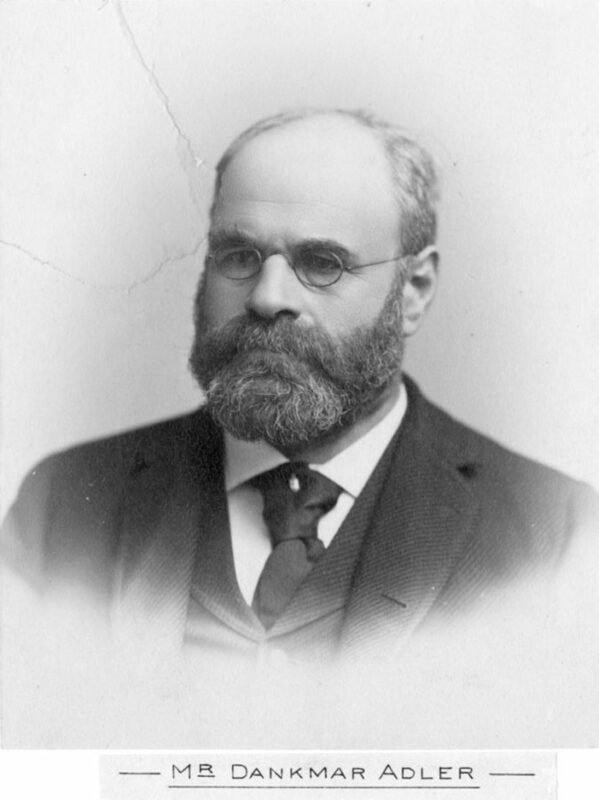 After his service, he returned to Chicago and eventually started his own firm in 1879. 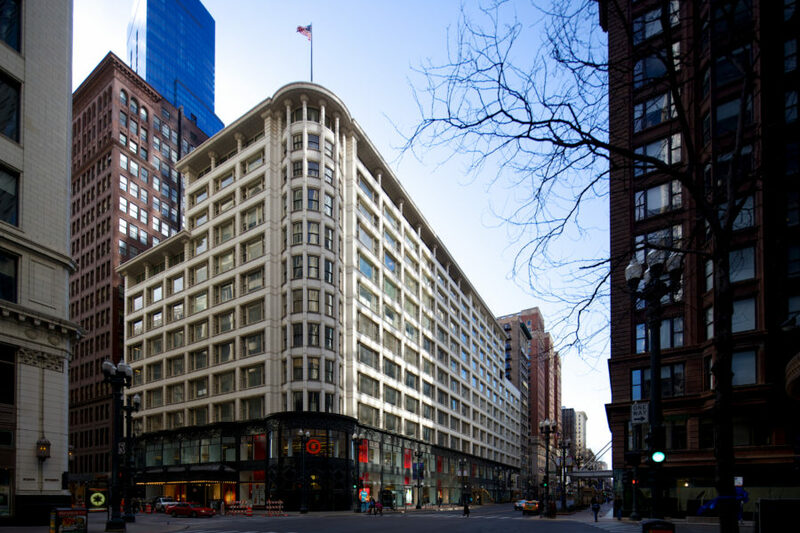 Not long after, he hired Louis Sullivan, who quickly became a full-fledged partner of the firm. 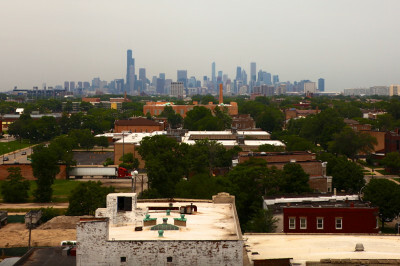 The greatest private building enterprise ever undertaken in this country is now in progress in the city of Chicago–a city which this year celebrates its fiftieth anniversary […]. The colossal structure, of which an engraving is presented on another page, massive and imposing as it appears, is less expressive of progress in architecture than of the march of empire. Their partnership resulted in some of the finest examples of architecture that exists. 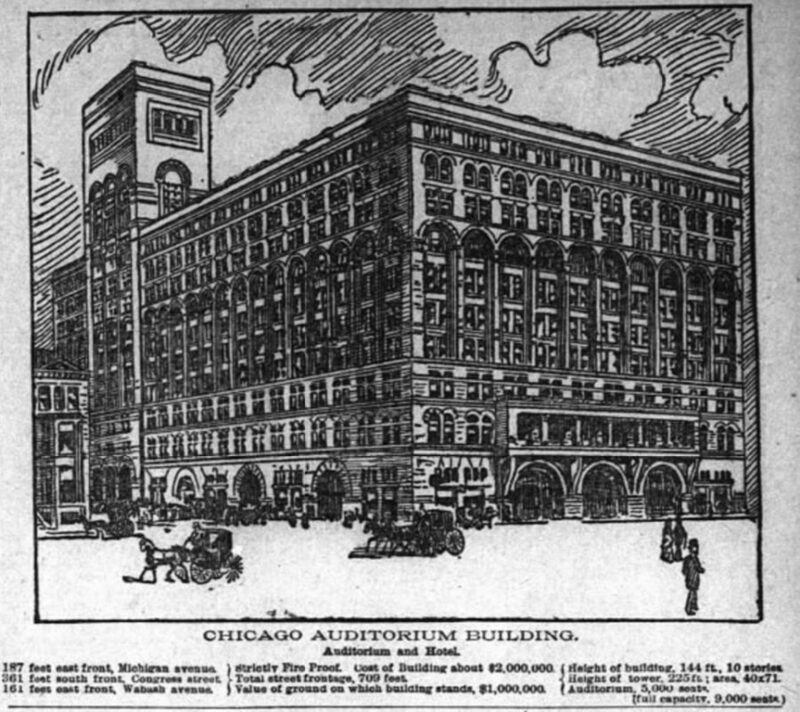 The firm’s design of theaters and auditoriums also had the finest acoustic engineering of the era. May 9, 1893, issue of Chicago Daily Tribune. 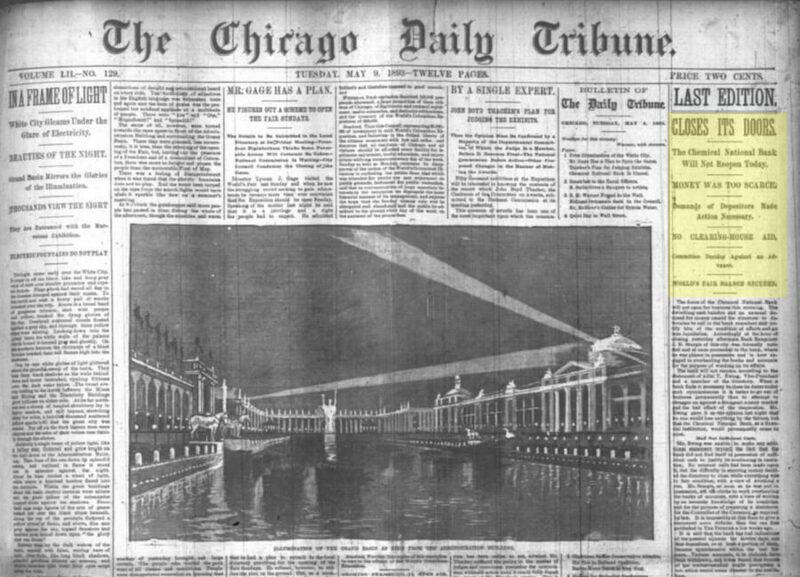 Top left story reads: “IN A FRAME OF LIGHT / White City Gleams Under the Glare of Electricity.” Right story reports on the failures of Chemical National Bank, which kicked off the Panic of 1893. Adler & Sullivan’s success–unprecedented for nearly 15 years–began to unravel when the Panic of 1893 struck. The heady days ushered in by the World’s Columbian Exposition came to an end as a result of shoddy banking practices. The bank associated with the Fair, Chemical National Bank, failed. There were runs on banks large and small across Illinois. The Fair was dealt a hard blow. As a result, Adler & Sullivan’s staff was trimmed, going from more than 50 people down to the firm’s principals: Adler and Sullivan. Worried about his family’s financial well-being and the firm’s lack of new clients, Adler took an engineering position with an elevator company that paid a yearly salary that was more than he had ever earned with his own firm. The economic crisis split apart one of the most important architecture partnerships that had ever existed. However, the new stint didn’t last long. Historical records offer few details, but Adler unsuccessfully tried to renew the former partnership. He began work with his own firm in partnership with his son–in an office in the auditorium building where Sullivan also worked. Despite the common perception of a bitter or non-speaking relationship following the end of the firm, the two men remained in personal contact and even collaborated on a few more projects. Adler provided engineering designs for the Carson, Pirie, Scott and Company Building (above) to Sullivan, after the dissolution of their firm. To this day, Dankmar Adler rarely, if ever, receives enough credit for his contribution to this National Historic Landmark. Adler was primarily an engineer (structural and acoustic), and it is evident when considering Ebenezer Missionary Baptist Church. His inspiration for acoustic perfection may have been inspired by his father’s profession as a rabbi. The importance of carried sounds throughout the house of worship was paramount. It was not a matter of mathematics, not a matter of science. There is a feeling, perception, instinct and that Mr. Adler had. Mr. Adler had a grasp of the subject of acoustics which he could not have gained from study, for it was not in books. He must have gotten it by feeling. 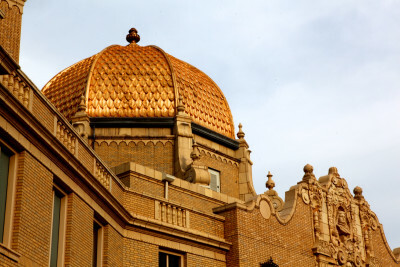 The exterior of the building is a slightly modified version of Classical Revival, without the geometric ornament frequently seen on the buildings he co-designed with Sullivan. 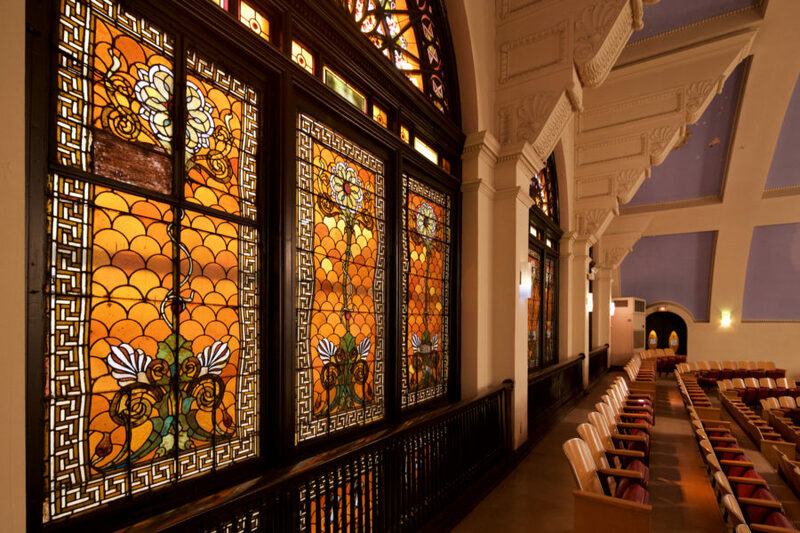 The opalescent leaded glass windows feature sunburst patterns, a clear influence from Sullivan’s geometric ornament. … if ‘form follows function,‘ it does not follow in a straight line, nor in accordance with a simple mathematical formula, but along the lines of curves whose elements are always changing and never alike; and if the lines of development and growth of the vegetable and animal organisms are infinitely differentiated, the process of untrammeled human thought and human emotions are even more subtle in the differences and shadings of their manifestations. Before accepting Mr. Sullivan’s statement of the underlying law upon which all good architectural design and all true architectural style is founded, it may be well to amend it and say: ‘Function and environment determine form,’ using the words environment and form in their broadest sense. In the case of Isaiah Temple (known today as Ebenezer MB Church), it’s possible the ‘environment’ was the client or congregation. Rather than the Moorish or other Far-East styles common among synagogue construction at the time, Isaiah Temple picked a more Mediterranean-styled inspiration, closer to the palaces and houses of worship of Greece and Roman cultures. Furthermore, the exterior design follows the essence (the impressive, grand auditorium) of the building. There are no obstructions between the audience and the speaker. Every square inch of interior space appears to serve a purpose relating to acoustic engineering. This auditorium’s design would eventually help make the sounds of gospel music soar to heavenly highs. Temple Isaiah’s construction completed in 1899. A year later, Dankmar Adler died. The temple was his last project. 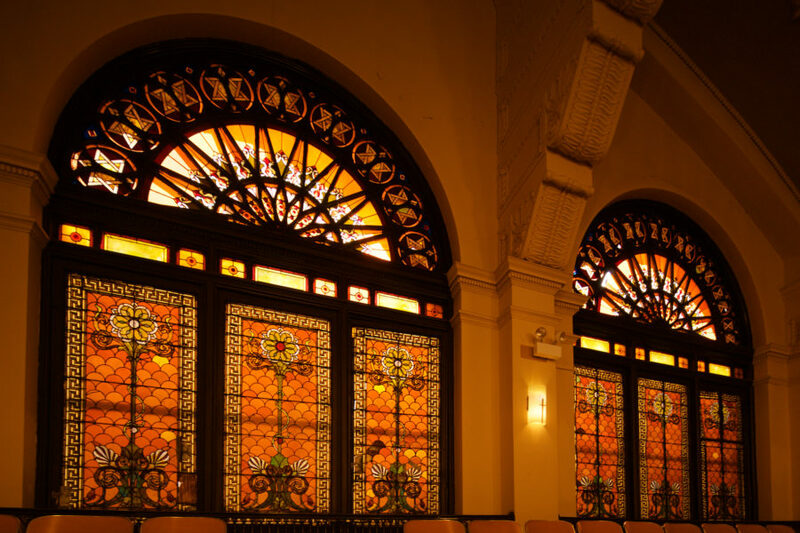 It still stands as one of only three surviving auditorium buildings he designed. Adler’s aesthetic would provide some inspiration to Frank Lloyd Wright, who was once a draftsman at the Adler & Sullivan firm. 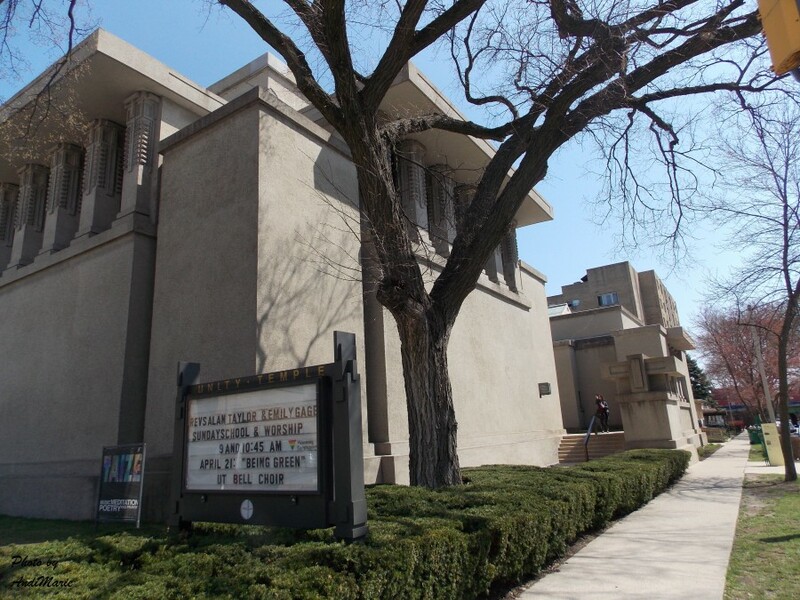 According to historian Joseph Siry, Isaiah Temple shows a clear influence on Wright’s Unity Temple in Oak Park. As the 1920s approached, the reform congregations began various merger discussions. 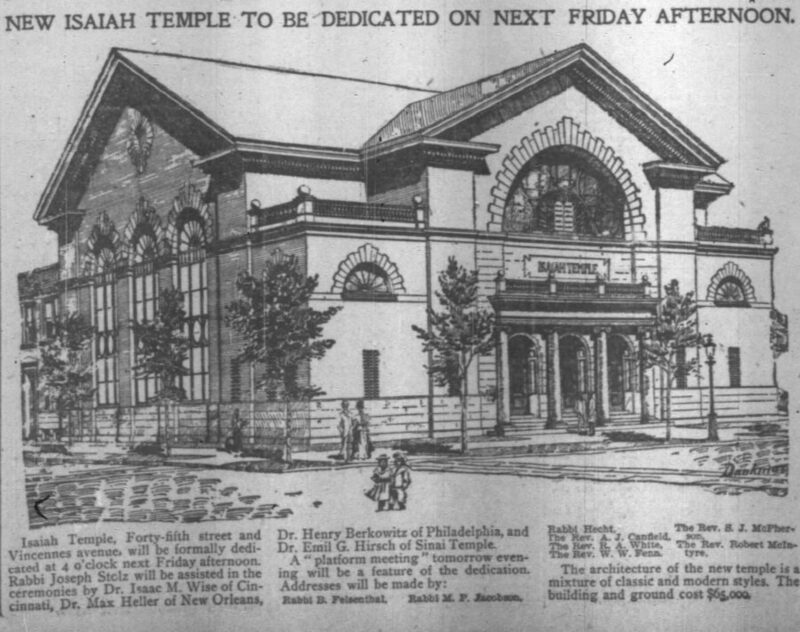 In 1921, Isaiah Temple sold its building to the Ebenezer Missionary Baptist Church and began construction on a new synagogue on S. Greenwood Ave. and E. Hyde Park Blvd. The Byzantine-style structure was also designed by Alfred Alschuler and was completed in 1924. Shortly thereafter, B’nai Sholom Temple Israel merged with Isaiah Temple to form Temple Isaiah Israel. 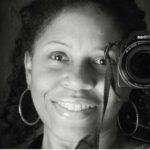 Without a merger partner, KAM sold its building to the Pilgrim Baptist Church and moved into a large Greek-revival temple at S. Drexel Blvd. and E. 50th St. in 1923. It did not move north and east to merge with Temple Isaiah Israel until 1971, forming what is now KAM Isaiah Israel. Ebenezer Missionary Baptist Church began 1902 with a congregation of 30 members who had split from Olivet Baptist Church (current location pictured above). 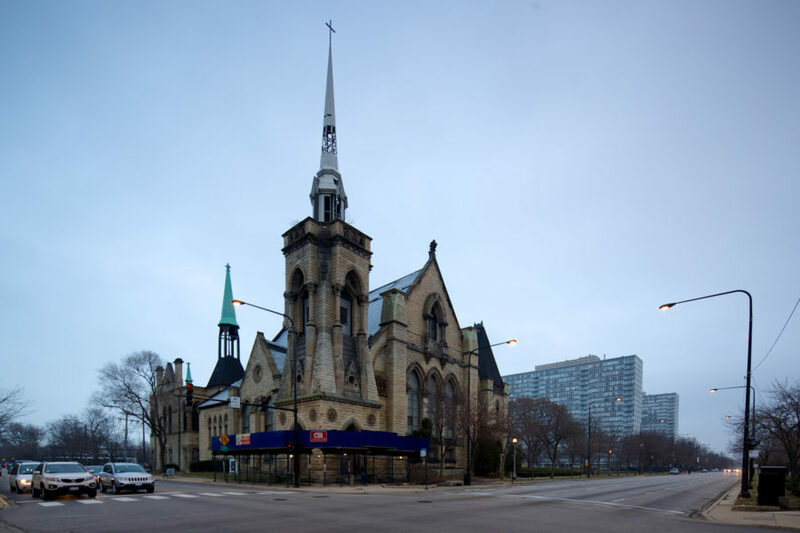 Olivet Baptist Church was founded in 1862 and is the oldest African-American church in Chicago. Rev. John Francis Thomas led the new congregation at Ebenezer Missionary Baptist Church. World War I created a series of events that led to the Great Migration. The war halted immigration even as it increased demand for manufactured goods and the labor to produce it. In light of this demand, factories opened their doors to African-Americans. The promise of wages and escape from persecution in the South led to a massive influx to Chicago. The dramatic demographic change led to a much larger congregation for Ebenezer Missionary Baptist, which reached nearly 2,000 people around 1920. Almost 20 years after its founding, Rev. Thomas led efforts to find a new home for the growing congregation. 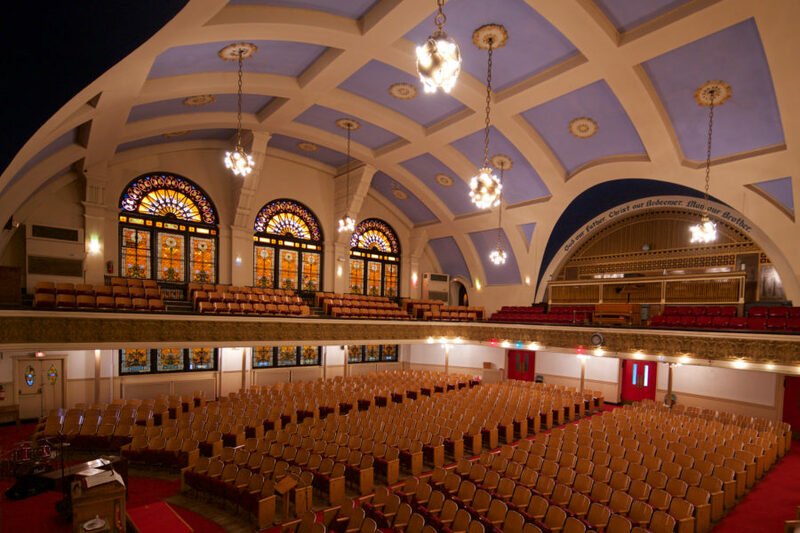 In 1921, he began negotiations to purchase the building from Temple Isaiah. He died later that year. Rev. Charles H. Clark, a minister in Nashville, was tapped to lead the congregation after Thomas’ passing. He led for ten years, growing the flock to more than 3,000 and paid off the mortgage on the new building ahead of schedule. But by summer 1930, rumors and grumblings concerning his salary and personal life. After a few dramatic public events, Clark resigned, leading to the arrival in 1931 of Rev. Dr. James Howard Lorenzo Smith of Tabernacle Baptist Church in Birmingham, Alabama. 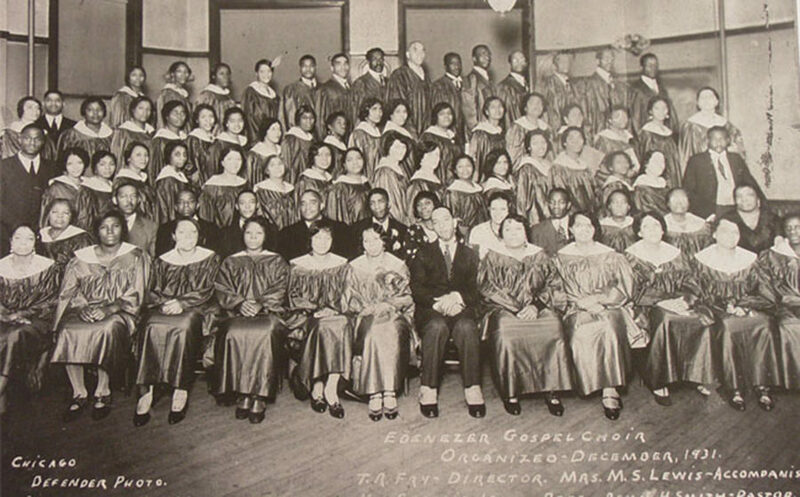 The first gospel choir at Ebenezer in 1931. Photo courtesy wttw. On December 6, 1931, he preached to his congregation about a vision he had received. Rev. Smith’s vision was of a choir of Christian men and women sitting behind him singing what he called, “Good old-fashioned songs sung by our forefathers down in the southland.” In this sermon, Rev. Smith gave the call for the organization of the first gospel chorus. Rev. Smith put together a team of music innovators to direct the chorus. He called upon professor Theodore Frye as director and professor Thomas A. Dorsey as pianist. In January 1932, after only a month of rehearsals, the Ebenezer gospel chorus made its debut in a church filled to capacity. The 100-member chorus wowed the congregation with their soulful Southern-influenced spiritual sound. Pilgrim Baptist Church, originally built as Kehilath Anshe Ma’ariv Synagogue by Adler & Sullivan. Ryerson and Burnham Libraries Book Collection, Ryerson and Burnham Archives, The Art Institute of Chicago. 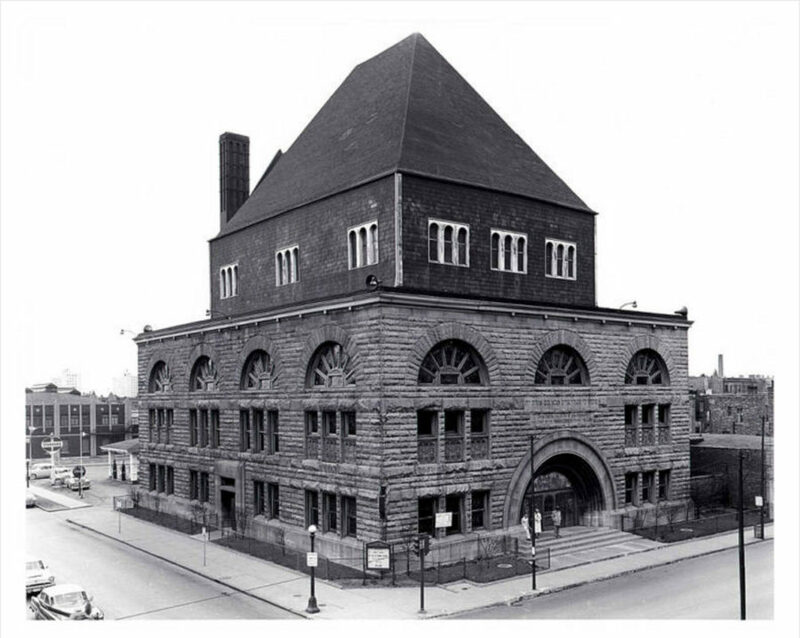 Just a few weeks after this, however, Thomas Dorsey, the pianist, left Ebenezer to lead a new gospel choir at Pilgrim Baptist Church (above), accepting an offer from its pastor, J.C. Austin. The reasons for this sudden change were explored in Wallace D. Best’s book, Passionately Human, No Less Divine: Religion and Culture in Black Chicago, 1915-1952. It’s noted that Dorsey’s reason for leaving wasn’t entirely clear. He didn’t leave for financial reasons, (Dorsey stated “it wasn’t paying nothin‘”) or for prestige, something he already possessed as being the first and only gospel choir leader in Chicago. Whatever the motivation, Dorsey accepted the position and Pilgrim Baptist – not Ebenezer – became known as the birthplace of gospel music. Coincidentally (or not), this building also shared the acoustic quality of Ebenezer Baptist Church. 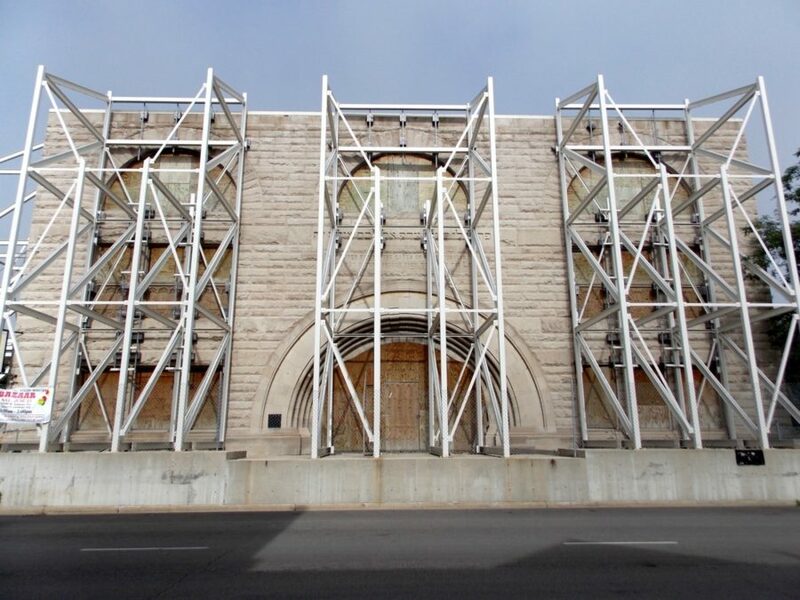 Pilgrim Baptist Church’s building was designed by Adler & Sullivan, and sadly, was destroyed by fire in 2006. I have no shame telling people I grew up in Englewood. That neighborhood is well-known for its violence and poverty, but people with strong values can survive and thrive. The Lord blessed me with an incredible family structure who would not allow me to become a victim of the streets. My parents set a high standard for academic achievement, and they wouldn’t compromise. Anything short of excellence simply was not tolerated. He received a journalism degree from Northwestern University a Masters in Divinity from Northern Baptist Seminary in Lombard. In 2012, Ebenezer received landmark status from the city. In the video above, members are singing in celebration of that designation. You can find that video and more through the church’s Facebook page, The Birthplace of Gospel Music. To experience this architectural and acoustic wonder, you can attend its morning services. 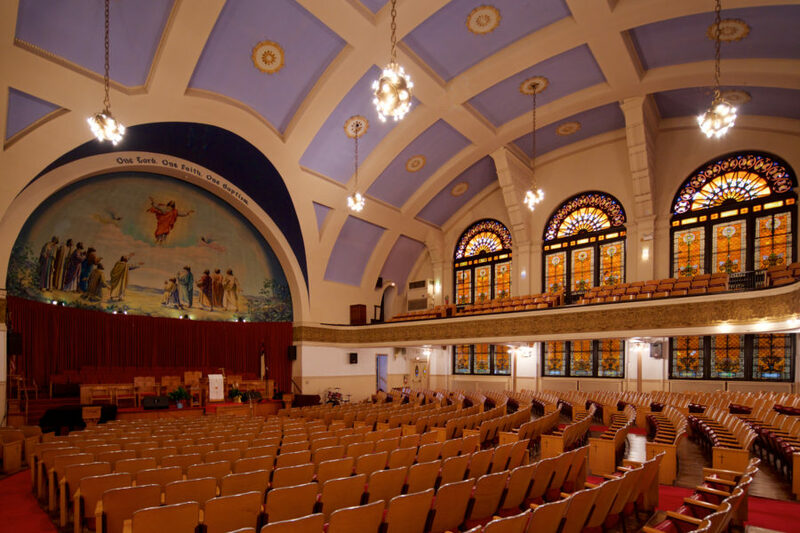 The church is also a regular participant in Open House Chicago, an annual fall event in which hundreds of buildings throughout the city are open for the public to tour. 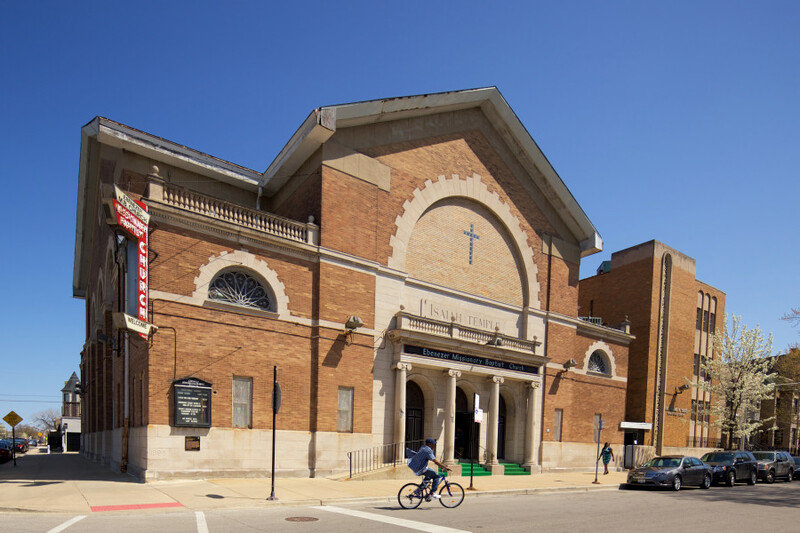 Ebenezer Missionary Baptist is a place you should visit–it’s a living thread connecting many priceless cultural treasures. Excellent John! I have to visit this historic sacred space. You should! So much history and beautiful architecture in one place. Sorry I didn’t get a chance to get back to you, John, but you have captured the essence of Ebenezer very well! It is certainly a site worth visiting. Thank you for the kind words, Patricia. And thank you again for the tour and history of your wonderful church. Wonderful information about my home church. My family was life long members there. I grew up playing the pipe organ at Ebenezer.